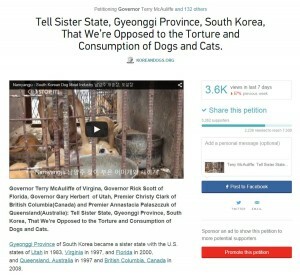 Petition letters mailed – Virginia, Florida, Utah, British Columbia and Queensland – Tell Sister State Gyeonggi Province to stop the torture and consumption of dogs and cats! Home / Blog / Petition letters mailed – Virginia, Florida, Utah, British Columbia and Queensland – Tell Sister State Gyeonggi Province to stop the torture and consumption of dogs and cats! We mailed petition letters for the petition, Governor Terry McAuliffe of Virgina, Governor Rick Scott of Florida, Governor Gary Herbert of Utah, Premier Christy Clark of British Columbia(Canada) and Premier Annastacia Palaszczuk of Queensland(Australia): Tell Sister State, Gyeonggi Province, South Korea, That We’re Opposed to the Torture and Consumption of Dogs and Cats! to the Governor Terry McAuliffe, Governor Rick Scott and Governor Gary Herbert by USPS Certified mail with return receipt service as below, and Premier Christy Clark and Premier Annastacia Palaszczuk by USPS international first class mail on April 16, 2015. Also copies of all the letters were mailed to the Gyeonggi Province Governor Kyung-Pil Nam (1 Hyowon-Ro, Paldal-Gu, Suwon City, Gyeonggi Province, 442-781, South Korea). This petition is still open and we will send the letters again when we reach 50,000 signatures so please click HERE to sign and share! 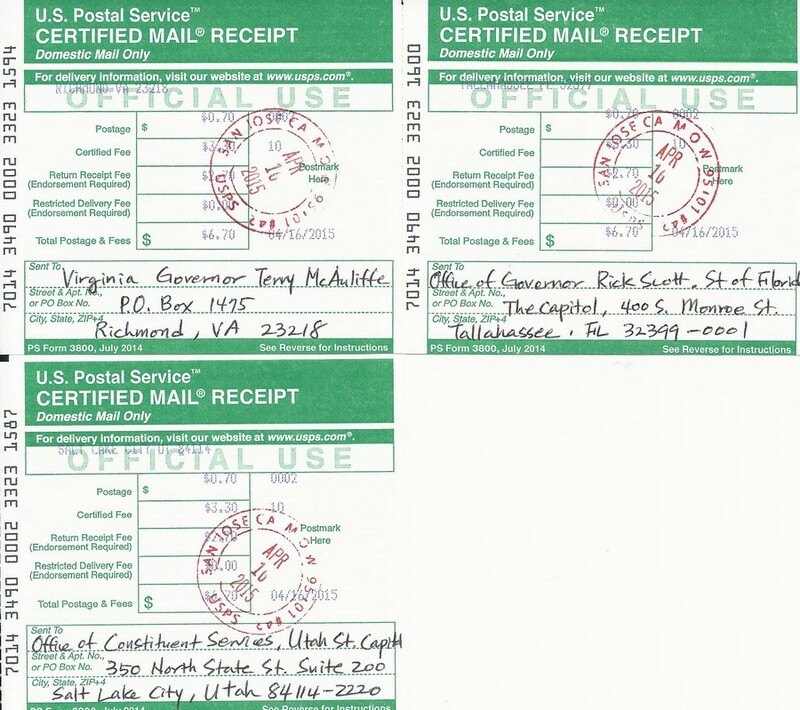 Receipts for USPS Certified Mail with Return Receipt Services for the petition letters mailed to the Governor Terry McAuliffe of Virgina, Governor Rick Scott of Florida, and Governor Gary Herbert of Utah.